Now viewable on iPhone and iPad! 802.11b/g/n Wireless LAN Designed to not only work with your existing wired network but also can be compatible with standard 802.11b/g/n wireless devices, allowing the flexibility to install and operate the IP207W without running network wire, and utilizing SSID filtering and powerful 64/128 bit WEP and WPA/WPA2-PSK encryption helps to protect your wireless network from illegal intrusion. Simultaneous HTTP and RTSP streaming The camera support HTTP and RTSP/RTP/RTCP protocol, and provide multiple HTTP and RTSP streams simultaneously. Snapshot and Recording You can capture a still image of the camera view on your PC and save the image as JPG or BMP format file. You also can record the video and audio captured by the camera on your PC and save as an ASF format file. Image size Three image resolutions available: 640 x 480(VGA), 320 x 240(QVGA), 160 x 120. Frame rate Twelve options: 1/2/3/4/5/6/8/10/15/20/25/30 frames per second (fps). 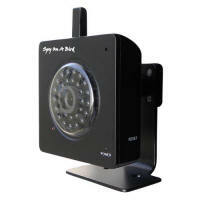 Motion Detection The IP207W is equipped with a built-in motion detection function that can generate an alarm trigger. Unlike conventional activity detection, the IP207W uses vector information to detect motion, achieving robustness against noise components. Once anything happens, still images can be sent to a specified e-mail address or FTP server. Security mode Security mode is not only WEP64bit or WEP128bit but also WPA-PSK or WPA2-PSK. Multi-User Access Up to 64 users (including the admin) can be created. 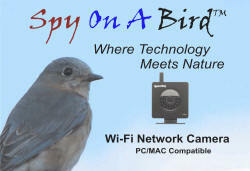 The camera allows up to 16 users to view the video simultaneously. Infrared Night Vision The camera utilizes infrared LED to provide light in the dark. The LED will be turned on automatically and the images will be black and white. Users can monitor clearly the things within 12 meters (~36 ft) distance. Users can select to turn on or off the infrared LED manually. User can also select whether change the images to black and white or color automatically.